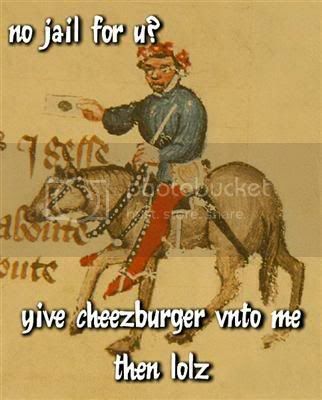 Geoffrey Chaucer Hath a Blog: I CAN HATH CHEEZBURGER? Myn gentil rederes, the joly tyme of Averille and May hath not been of much jolitee to me – in feyth, ich haue had but litel tyme to look upon the newe floures and heere the smale foules doyng their thinge, for cursid busynesse hath fallen a-newe vpon me. I was prikked to take thys biswinkful newe labor by grete nede, for whan ich madde myn accountes ich discovred gret dettes and but litel revenue. 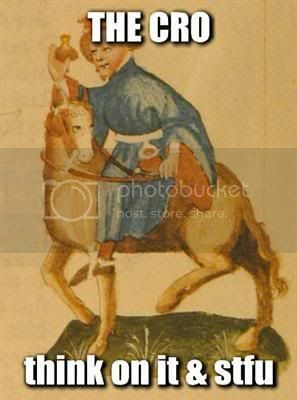 Thomas, who ys wyth my Lord John of Gaunt in Spayne, had gret need for moneyes to buye a newe blakberrie (for his hath been y-swiped by the Frensshe), and Lowys hath taken up an internship for the somer wyth a Man of Law and thus did need many a fyne robe and tie (ywis, Lowyses raiment on moost dayes ys but a tee shirte and jeans that falle neigh hys ankles for thei aren so loose). Performing the dutees of a Justice of the Pees ys helle of interestinge (cheefly whan we usen blacklites at a crime scene) but it payeth slightli less than nothinge. Ech daye, the many notyces did arryve from Master Card and from thos whom I owed dettes, and at long laste Philippa did taak the mattir into her owen strong, usually shakinge with anger, handes. In myn owen name and in myn owen script she wroot to my Lord Kynge Richard and asked if ther was sum posicioun available. And so, my freendes, ich haue bicom the Clerk of Kinges Workes. Myn abacus, the which was in the store-room yput wyth Lowyses astrolabe, now gooth with me wheresoever ich go lyk vnto a new, wooden, boringe Ruth. Everich weekend, meseemeth, ich must go to Westminstre, or to the roail palais at Sheene, or to sum smal manor at which several important but unwiedli obiectes are kept that must, withouten delaye, be brought to sum oothir smal manor. And the clerk bifore me did leeve thinges in a soory state. Ich do beleeve that myn predecessour was yiven his knowledge of letteres by chikkens, for hys writinges and accountes aren moore lyk the walking up and doun of several hennes than any maner of human script. Peraventure he was bisy eetinge seed and clucking, for he did but litel of hys job: many an angrie gardiner or ice sculpture maker hath contacted me and yiven me muchel guff for not havynge been y-payed for labor in the kinges servyce. And get me not started concerninge the stonemasones union. But the cash beginneth to flowe. And thus myn owen accountes shal be made wel by my labour on the accountes of the propertees of my Lord the Kyng. Al of my transportation of sundrie materials and makynge of accomptes hath left me but litel tyme for writing. Ywis, it hath left me but litel tyme for food, sleep or breathinge. 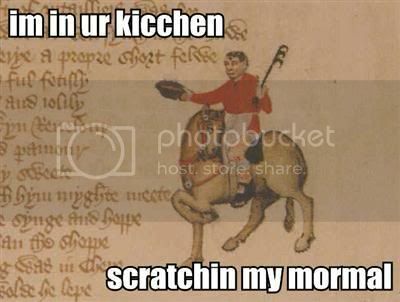 And yet in this derke tyme of sorwe and tene, ich haue foond much deliit in the merveillous japeries of the internet. No thyng hath plesed me moore, or moore esed myn wery brayne than thes joili and gentil peyntures ycleped “Cat Macroes” or “LOL Cattes .” Thes wondirful peintures aren depicciouns of animals, many of them of gret weight and girth, the which proclayme humorous messages in sum queynte dialect of Englysshe (peraventure from the North?). Many of thes cattes (and squirreles) do desiren to haue a “cheezburger,” or sum tyme thei are in yower sum thinge doinge sum thinge to yt. 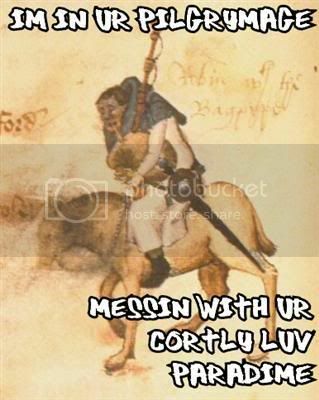 For many dayes ich haue desyred to maak Lolpilgrimes from the smal peyntures that Mayster Linkferste hath ymaad for my Tales of Canterburye - not oonly wolde it be a thing of muchel solaas to me, but it wolde be a good “pre writing exercise” (the which myn tutor, Archbishop Arundel, did alwey saye were of gret necessitee). 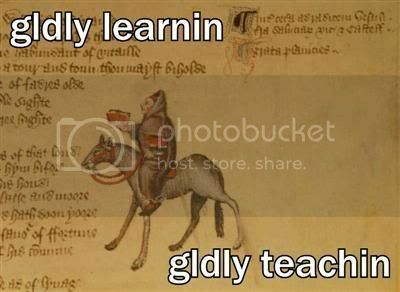 And thus to-daye whanne ich had a smal spot of tyme bitwene a meetinge wyth a feng shui consultant and a recopyinge of the inventorie of carpentrie supplyes in Windsore, ich did go unto the wondrous LolCat Scriptorium of Gordon de McNaughton and did just go crazye. Syn ich haue not in many dayes y-poosted, ich shalle share with yow myn laboures. heere ich refute a clayme of grete errour that was ymaad at Kalamazoo (to which Sire John did travel and did heere and report the sclaundre). Until next tyme, gentils alle, may you hath ur cheezburgers, and ich praye God and Seynt Anthonie the Abbot that ye maye alle fynde ur buckets. 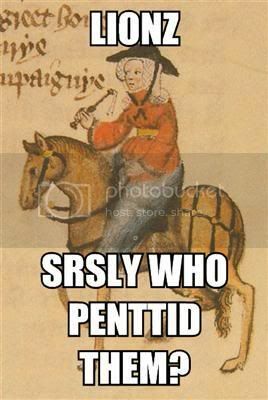 O GC, yower LOLpilgrims doe gyve grete delyghte and solace! Ich am muchel plesed specialie by the LOLPardoner. Hit ys ful of mirthe becawse yt is trewe! The LOL Prioresse fills me with great delight! Wel maystow saye that oure Persoun Jankyn knowyth to LOLlen, for dydde nat oure Hooste, gode Harry Bayly, smellen hym as "a LOLlere in the wynde", whanne he dydde swere be Goddes dignitee, and the Persoun it lyked nat? The teres skyppen doun myn chekes, swich mirth yow giue me, Daun Geoffrey! Please tell me you are making t-shirts of these! Doth that make thee a Lollard? 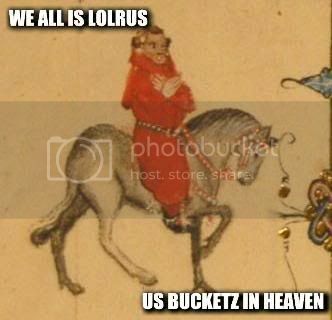 I thought they should be lolgrims, but lollards is much funnier. Plz xcus spelg, bt see Paypal 4 a Donation Button 4 yr xclnt cyt. Soe grete is myn myrth, ich hath wyth kaffee myn screne yshoured! I'sooth, with laufter am Ich quyte o'ercome, and I moun wax wod for mickel mirth and meryement. Myn gode Maistre Chavcer, thyn reference to 'newe labor' doth unnerve myn wyse and prudent counsellour Gordon le Brun. He believeth it hath too tony an blaire. For Ovre parte, UUe are well plesede by thyn diligence in Ovre Seruice. Please please please do a Parson T shirt! It's not every day Chaucer states the thesis of my book so elegantly! O myn God. Thine site it pleaseth mee with grete delighte. I have just discovered your blog and must say how good it is. I'll certainly be back to visit. If you get a chance, please feel free to say hello on mine, I 'd love to hear from you. 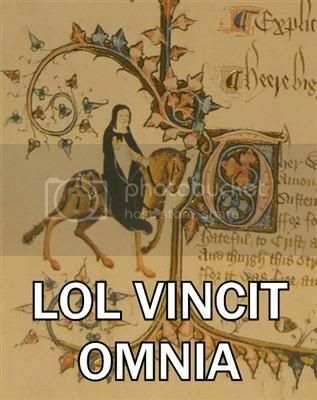 Yower LOLpilgrimmes maketh in me myche delychte! LOLZ in mine sum thinge doinge sum thinge to yt! I must know what "biswinkful" means. It's become my favorite word, and I've been using it in various contexts since I first read it here, and it's served me well, so I thought that the least I could do would be to find out what it really means. THAT is the funniest thing. Just found you. Bloody superb. 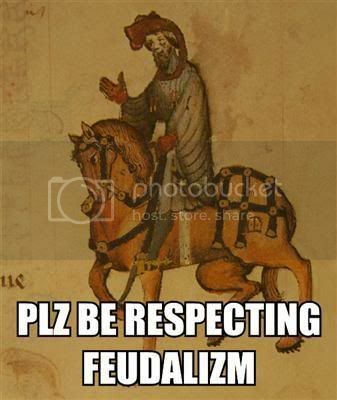 "I must know what "biswinkful" means"
I iz in ur history txt books. mkin lyk history n stuff! Ich hyve baen LOLing abyut syns fyndyng thys. Thank yu. Why hastow nat for mony weke ybloggen? 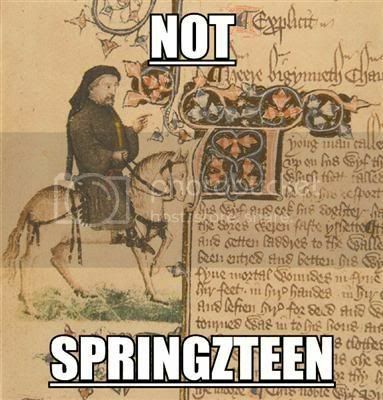 In trewthe, it doth bring teres to mine harte. Thy Millere hath made me laugh most heartily, and I shall show thy site to the young maides in my class who question the relevance of grete bookes to moderne life. I too enjoy the Prioress immensely. Ich wys seized wyth a lauchin-fitte wych seeketh to dislodge mye weye bowelles whan Ich haue redde thys poste. This was just brilliant; thank you. 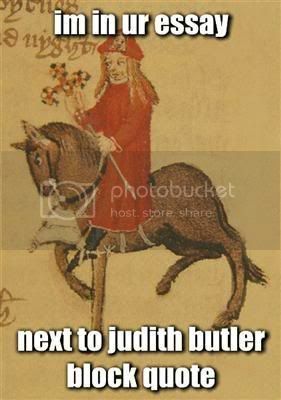 As one who is writing about Chaucer, the comment about the Pardoner being next to a Judith Butler block quote was especially funny. Slightly confused but I love it. The Cook: hilarious! what a wonderful post!!! please loggethe in to photoebuckete! youre account est unactive and i canne see the lolpilgrims :c.